On 25 May 2017, a new supernova was discovered by R. Arbour in the stunning galaxy NGC 3938: it is SN 2017ein, a type Ic supernova. The host galaxy is extremely beautiful and we are happy to share this image with you. The image above comes from the sigma-clipping combination of six, 120-seconds exposures, unfiltered, remotely taken with the 16″-f/3.75 Tenagra III (“Pearl”) robotic unit part of Tenagra Observatories in Arizona. The imaging camera is based on the KAF-16801 CCD. The resulting image scale is 2.4″/pixel. 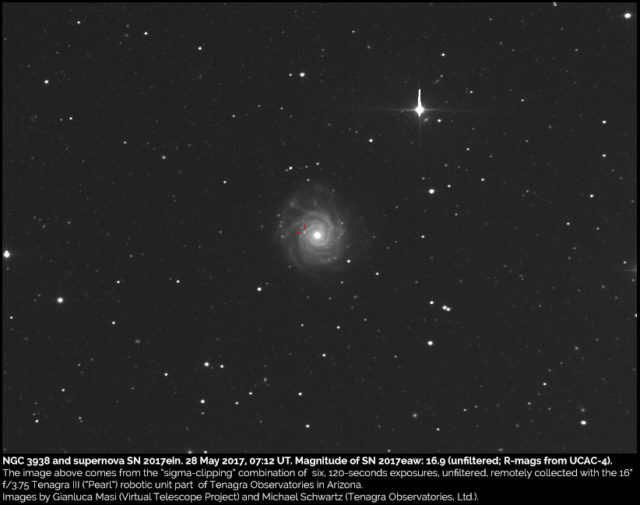 SN 2017ein magnitude was estimated to be at mag. 16.9 (unfiltered, R-mags for the reference stars from UCAC-4). Spectroscopy showed this transient to be a type Ic supernova. NGC 3938 is a wonderful face-on galaxy, placed in the Ursa Major constellation, at about 45 millions of light years from us: it was discovered by W. Herschel in 1788.